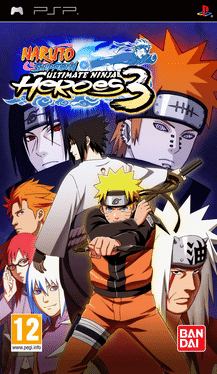 Naruto Shippuden: Ultimate Ninja Heroes 3 puts players' fighting spirits to the test with intense and frantic battles while using one of more than 50 characters. New characters include Young Kakashi and Obito Uchiha from the Naruto Shippuden special, Kakashi Chronicles. For the first time in the series' history, Naruto Shippuden: Ultimate Ninja Heroes 3 expands upon the series' trademark fighting engine and updates it for four-player brawls. Team up with a partner to unleash a devastatingly powerful Jutsu team attack on opponents, or interrupt an enemy's Ultimate Jutsu to help or hinder another player.